The element that sets Wild Oaks apart from the rest of Grand Haven is its exceptionally large home sites with greater setback requirements. 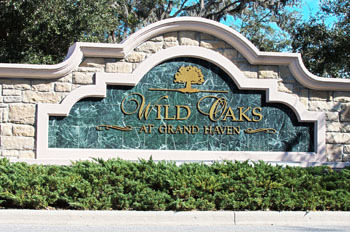 Wild Oaks is a neighborhood of estates and the privileged residents also enjoy the amenities of the gated community of Grand Haven including the private Jack Nicklaus Signature golf course and miles of walking trails overlooking the Intracoastal Waterway. At this point in time, Wild Oaks is the only option in Grand Haven if you desire a large expanse of land upon which to build your dream home. The views of naturally beautiful oaks, preserves, and lakes lend an allure that is elegant and enticing. Residents of Wild Oaks at Grand Haven enjoy access to recreation areas, although the northernmost one, Creekside Athletic Center, was built specifically for the convenience of Wild Oaks and the other northern villages of Grand Haven. Creekside Athletic Center offers an indoor lounge and game room, fitness center, pools for adults and children, croquet court, junior soccer field, volleyball and basketball courts, fishing pier, and outdoor grills. Contact us today if you are interested in estate living at Wild Oaks at Grand Haven.